Understanding Society has launched its fourth annual report of research that depicts the changing lives of individuals and households in the UK. Launched at a policy event in London, this year’s report includes chapters on Housing, Health Behaviours and Young People’s Wellbeing. Insights 2015 highlights selected findings emerging from research that uses the study’s rich data and offers commentary from leading policy thinkers. 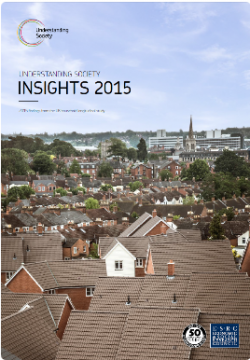 Insights 2015 focuses on highly topical policy issues and each chapter tackles a different issue. Chapter one looks at what current trends need to inform the debate on the future of housing. Chapter two focuses on how the UK can improve young people’s wellbeing and offer a more coordinated approach across government on mental health and the family. Chapter three discusses whether people’s health behaviours can be influenced through everyday activities. The report builds on previous editions of earlier Findings. As part of the launch, we have also launched a Housing Topic Guide that highlights the type of research questions that can be explored and some of the research that has already been published using the study’s data. Follow the #insights15 conversation on Twitter & sign up to our quarterly newsletter. Blog: Kick-starting the housing revolution – but who will benefit? This news item has been reposted from the Understanding Society website.